We're still recovering after attending what must be one of the most entertaining and stimulating gatherings that ever took place in this city. The Amazing Meeting (TAM) lived up to its name with acts such as Tim Minchin, Ben Goldacre, Adam Savage and Jon Ronson entertaining an audience of hundreds at the Mermaid Conference Centre (ironically located across the road from the Scientology HQ on Queen Victoria Street). Despite costing £175 a ticket, the weekend conference sold out in just 1 hour. Attendees (including Jonathan Ross) and performers were united in the cause of skepticism. The movement, which promotes rational, evidence-based thinking, still has the feel of a subculture, not yet a term with general public traction. But if you howl at crass headlines like 'Mobile phones cause cancer', or agree with Tim Minchin's putdown of homeopathy - that 'Water has memory? And while its memory of a long lost drop of onion juice is infinite, it somehow forgets all the poo it’s had in it! ', then you too are a skeptic. Skeptical troopers engage in numerous skirmishes on the battleground of unreason. These includes combatting dodgy marketing claims, challenging practitioners of alternative medicine, promoting a moral life in the absence of any gods, and a whole raft of other areas where critical thinking is in short supply. We heard from Arianne Sherine, the fountainhead of the atheist bus campaign, which raised a staggering £153,500 in donations from people fed up with Jesus propaganda. The masterful Ben Goldacre, dressed and animated like a foul-mouthed Dr Who, gave a silver-tongued monologue about press fabrications (the press' favoured 'top MRSA expert' turned out to be a deluded amateur working from his garden shed) and dodgy clinical evidence. His bête noir Gillian McKeith got just one mention. 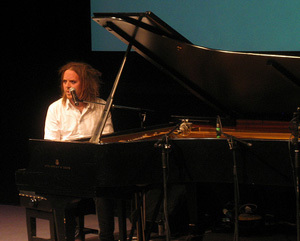 Star of the show, in a whole weekend of non-stop highlights, was Tim Minchin singing skeptical songs from a grand piano. If you've never seen him in full flow, check out the many YouTube videos - nobody fights woolly thinking with such subtlety, humour and flair. Other speakers included US comedy musician George Hrab, Glenn Hill (the now-aged son of one of the Cottingley fairy hoaxers), and host of Myth Busters Adam Savage. Perhaps the most revered figure in skepticism, James Randi was unable to attend due to his ongoing chemotherapy. But he was able to Skype in for a brief Q&A session with the audience. The weekend closed with the ever-popular Phil Plait, president of the James Randi Educational Foundation, walking the audience through the good, the bad and the downright ugly science flaws in Hollywood movies (Guess the film: "It's an asteroid. Why the f*ck is it raining?"). Although noted skeptic Stephen Fry couldn't make it, Randi was only here by telepresence, Dawkins sent a DVD as his proxy, and Penn and Teller were otherwise engaged, the first ever TAM London effervesced with erudition and personality. Abandoning skepticism for one moment, we'd like to declare it a complete success, without reference to any metrics or measurable evidence. It just rocked. To find out more about the skeptical movement, come along to Skeptics in the Pub every month in the Penderel's Oak, Holborn.